The game moves quicker when Beauden Barrett is playing. Billy Slater can spark something from nothing. Things happen around Dustin Martin. And add Kurtley Beale to a small group of players who, with most touches of the ball, gives you the feeling that a linebreak is brewing. They not only move faster in attack but get their teammates going with greater speed and precision. 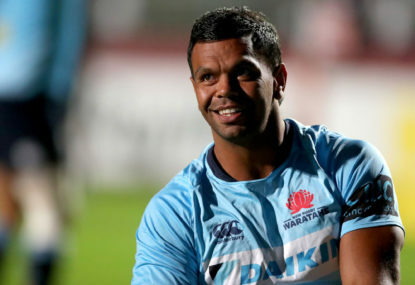 The Waratahs look a different side when Beale gets the ball at first receiver. It’s become more evident over the past fortnight, as the NSW No.12 has asserted himself more and the Tahs look to build momentum heading into the Super Rugby finals. Bernard Foley has been solid captaining the side in Michael Hooper’s absence, but the five-eighth looks more robotic and less influential in general play the more Beale gets the ball as first receiver. Beale is a class act, even when there’s not much forward momentum. Ball in two hands, mixing angled runs and flat passing with changes of direction behind the advantage line – he has been able to get the defensive line back on their heels. The space that Foley has found recently often comes when Beale links with him in the midfield; it happened numerous times against the Sunwolves last Saturday night. NSW have now found a nice balance, with Beale the No.1 playmaker from phase play, but Foley still being first receiver from the set piece. It hasn’t always happened this season, with Foley earlier in the year often being the main man one-out from most parts of the field. The interim skipper’s long passing is a big asset too, especially when Beale has dragged defenders in close. Foley was relatively quiet during the Wallabies’ Test series loss to Ireland, but some nice touches over the past fortnight have come at a good time. He’s off contract at the end of this season and aiming to impress the money men at the Waratahs and Wallabies, and land a big deal. There’s talk that Matt Toomua is close to signing a contract to return to Australia with the Melbourne Rebels next year, and if he puts pen to paper soon, he will likely be available to join the Wallabies for the November Tests in Europe. Foley has arguably been coasting at international level recently, with no genuine pressure on his position as Wallabies No.10. Quade Cooper has been brushed by Queensland and Rebels utility Reece Hodge has been used as a back-up five-eighth. Toomua’s presence could give Foley a lift as the World Cup approaches. But for now, the Waratahs look best when Beale gets more touches at first receiver from broken play and hopefully we see more of it when they take on the Brumbies on Saturday night. However – as we all know – the effectiveness of this separation of power between Beale and Foley will only be judged when the Tahs face a New Zealand side.